Existing concrete that is cracked, chipped, blemished, or simply boring can be coated with concrete overlays. These are thin applications of polymer-modified cement which cover surface imperfections. 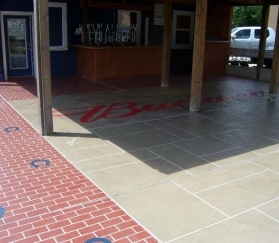 There are several types of overlays including broom-finished overlays (which restore regular gray concrete surfaces to near-original appearance), trowel-down or spray-down overlays (which give the slab a totally different texture, pattern, or color), and stampable overlays (which mimic the look of traditional full-depth stamped concrete). All of these options are viable alternatives to tear out and replacement of your existing damaged concrete. The decorative concrete resurfacing and overlays shown below were all designed and installed by members of the Indiana Decorative Concrete Network. These concrete contractors have years of experience installing concrete overlayments in Indianapolis, Central Indiana, and even in different states and countries!